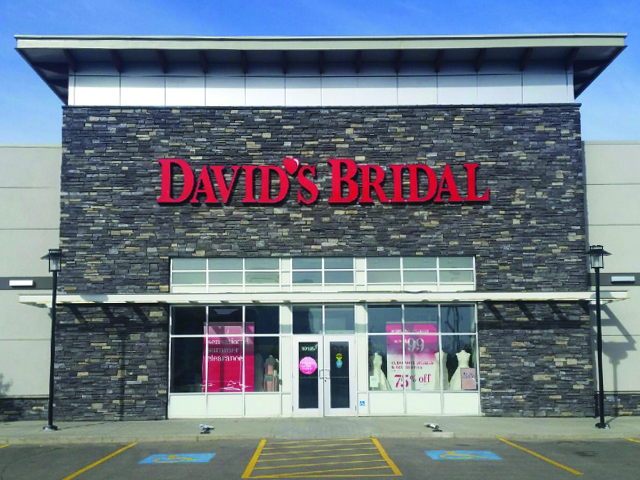 Welcome to David's Bridal Edmonton store, serving brides and special occasion customers of Beaumont, Sherwood Park, Nisku, and more. The following designer brands are available at this store: White by Vera Wang, Truly Zac Posen, Wonder by Jenny Packham, Melissa Sweet, and Oleg Cassini. David's Bridal is the ultimate one-stop shop for wedding dresses and formal apparel. Our exclusive assortment of bridal gowns features a broad spectrum of silhouettes, lengths, and styles, empowering you to find a unique look for your special day. Our wedding dresses, bridesmaid dresses, and feminine party looks are designed in the latest fabrics, colours, and silhouettes, from trumpet dresses to ball gowns to fabulous short styles. Our sizes span petite to plus, so every woman can walk down the aisle in the bridal dress of her dreams. In addition to designer wedding dresses, David's Bridal offers a full selection of prom dresses, flower girl attire, and communion styles. We have everything you need to complete your head-to-toe look, from shoes and handbags to jewellery and hair accessories. We also have expert in-house alterations to make sure you get the perfect fit. Make an appointment to come to our Edmonton location to browse our elegant cocktail dresses, military ball gowns, formalwear and, of course, dresses for brides and every member of the bridal party. We'd love to help you put together your look from dress to jewellery.